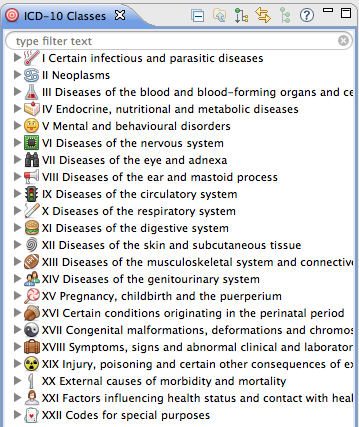 The international version of ICD-10 (International Statistical Classification of Diseases and Related Health Problems) is displayed in the ICD-10 view. There are separate views for the Australian Modification (ICD-10-AM) and the (American) Clinical Modification (ICD-10-CM). The codes are organized based on the hierarchical relationships, they can be expanded down to the four-character subcategories. 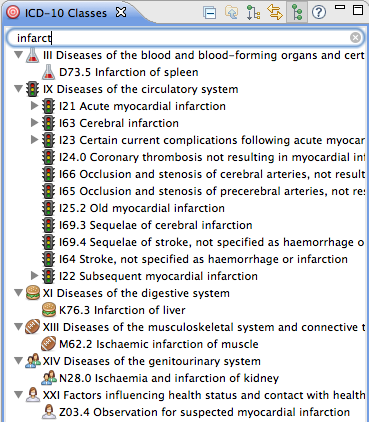 Each node displays the ICD-10 code as well as the ICD-10 label (e.g. 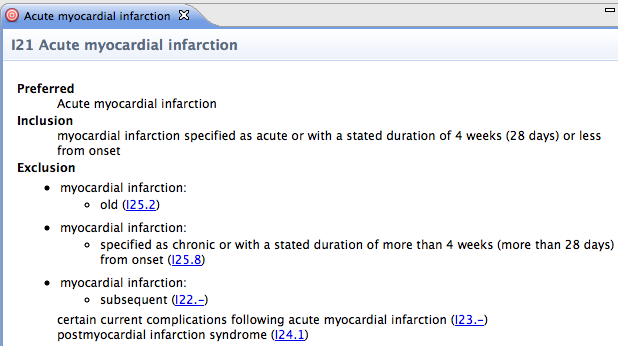 I21 Acute myocardial infarction). Different subcategories can be distinguished by dedicated items, e.g. a cake represents Endocrine, nutritional and metabolic diseases. The ICD-10 view uses the same functions as described in the section about the SNOMED CT view: You can use the text field to do filter searches, displays filter results hierarchically, link with the open editor, set a concept as the root node, return to the default root node, etc. Double-click any of the nodes to open the code in a read-only editor. The Overview tab displays the code, the label and the descriptions and the inclusion and exclusion codes with hyperlinks. The other tabs display details about mappings or value domains that reference the code. You can use the ICD-10 tab on the Search dialog to search for ICD-10 concepts by their code and label. The search is not case sensitive. The ICD-10 search also supports advanced query syntax discussed in the section on SNOMED CT. The results, which are displayed in the search view, are sorted based on a similarity score. The sorting can be changed by clicking on the column headers. Double clicking on a concept in the search view opens it in the ICD-10 concept editor. The features described above also apply for the Australian Modification of ICD-10 (ICD-10-AM) and for the (American) Clinical Modification (ICD-10-CM), which has a separate tab in the search dialog.